If you got to have an intimate conversation with your idol, what would you say? 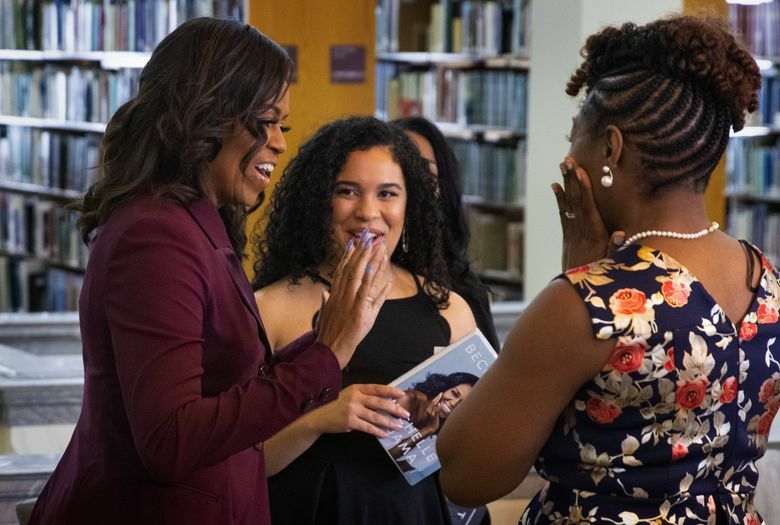 A few members of one lucky book club got to not only think about that, but actually fulfill it, when former first lady Michelle Obama met with them Sunday afternoon at the main branch of the Tacoma Public Library. Obama was in Tacoma on Sunday as part of her book tour to promote her memoir “Becoming.” Her Tacoma appearance was originally scheduled for Feb. 8 but was postponed due to a snowstorm. But the postponement did not dampen the enthusiasm of those who came to hear Obama speak on Sunday night. Obama’s 8 p.m. talk at the Tacoma Dome drew more than 18,000 people, and as event host Jimmy Kimmel joyfully announced, it’s the largest turnout so far of all Obama’s 21 tour stops. 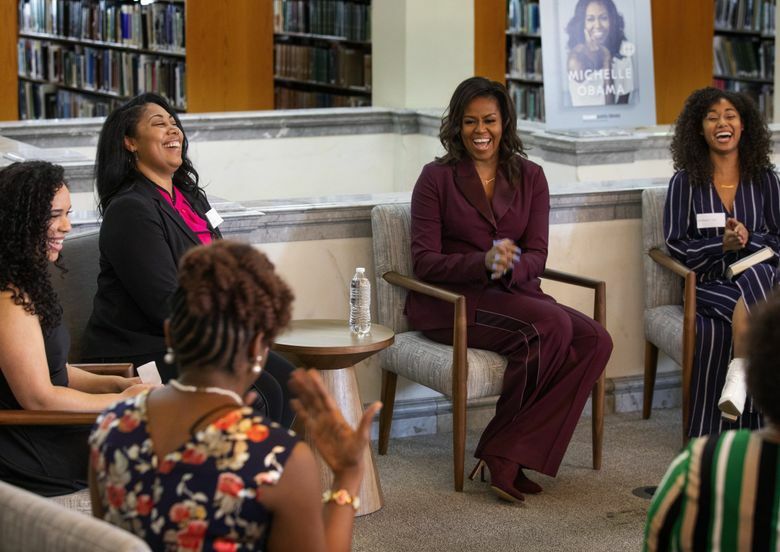 But hours before she greeted the masses, the former first lady sat down to chat with 13 women from a virtually run book club called Balanced Black Girl. Published in November 2018, “Becoming” is a personal look at Obama’s life in her own words. 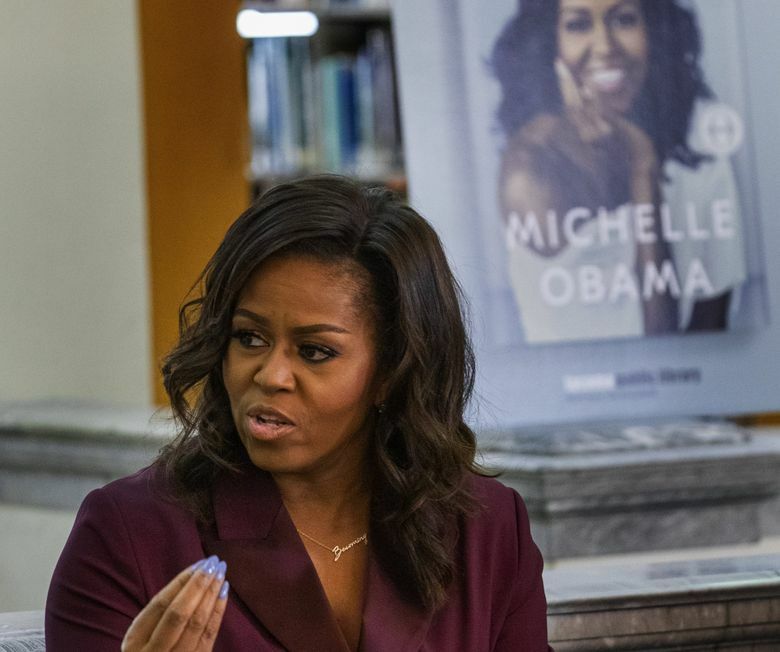 She takes readers through her humble beginnings on the South Side of Chicago to her whirlwind eight years as first lady of the United States. 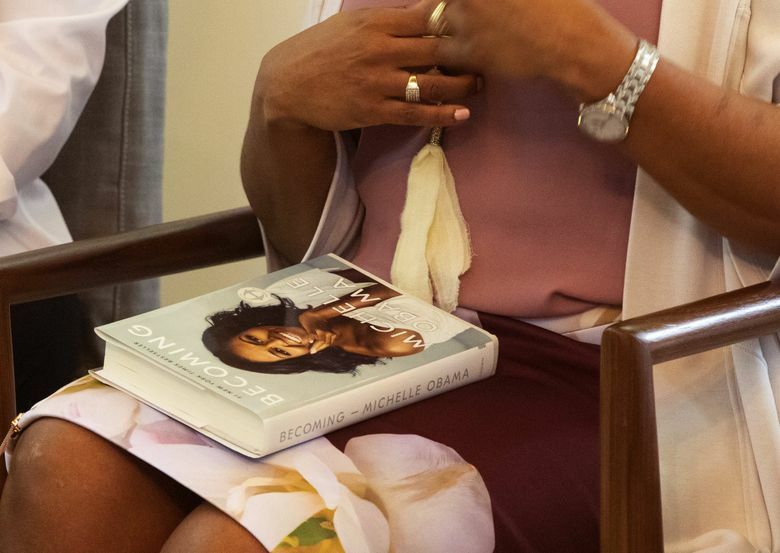 The memoir was the best-selling book of 2018 and more than 3 million copies were sold in its first month alone, according to the Washington Post. The Balanced Black Girl book club is only a few months old and “Becoming” was the first book the group discussed, Alfred said. After only one meeting, they got to have another with the author herself. The group greeted Obama with excitement and a slew of hugs, and she thanked the club for the opportunity and told them not to be nervous. 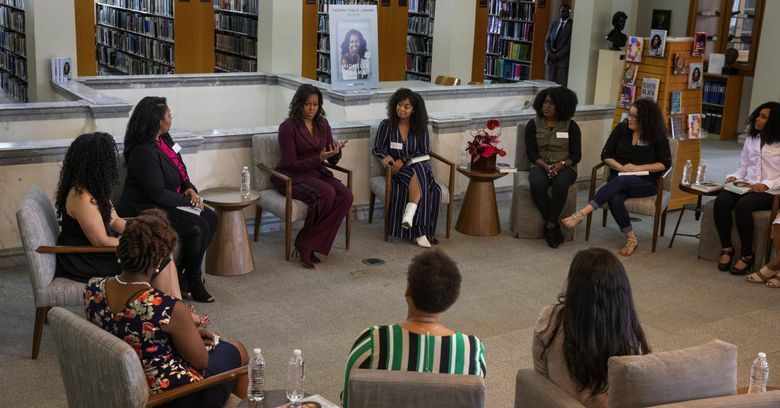 The Balanced Black Girl book club members introduced themselves to the former first lady and shared a little bit about their diverse backgrounds. Some thanked her, others shared laughs with her. One member joked that her husband had recently retired, just like Obama’s. Obama then talked about how some parts of her life were left out of her book and shared one of those moments in which a former thesis adviser doubted her, which led to her bigger point that she has had to work hard to prove herself her whole life. “It feels like all my life there is somebody telling me what I can’t do,” Obama said. Book club member Jennifer Henderson said she was so moved by “Becoming” that she is now putting that inspiration into action. Obama has been on tour since November, and she said these intimate discussions have been her favorite part of her book tour. 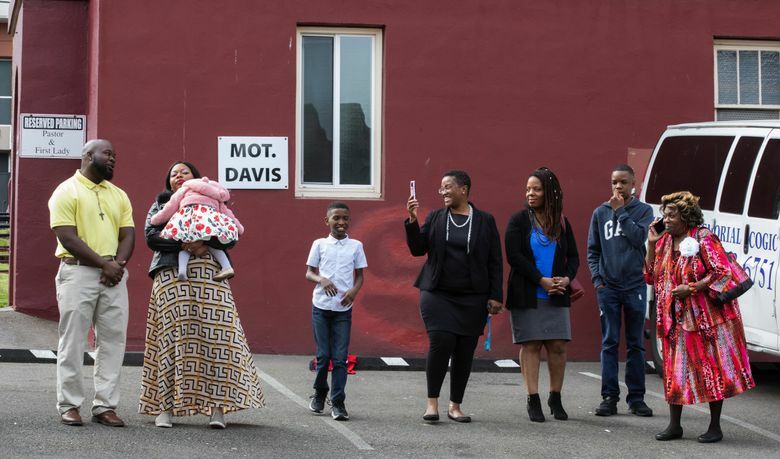 She has met with groups throughout the country, including high school seniors in Chicago, community activists in San Jose, California, and patients at a Children’s Hospital in Denver. By 5:30 Sunday evening, lines were already forming outside the Tacoma Dome as people waited to get in to hear Obama speak. Like the women the former first lady had met with at the library earlier, many of those waiting in line outside the Dome cited Obama as an inspiration. Anji Scalf, 35, drove from Sequim to Tacoma just to see Obama in part because she said the book helped her professionally. “I’m at a similar stage in my career that she explained in her book and it made me feel like I was on the right track,” Scalf said. Friends Penelope Walker and Rhonda Shabazz from DuPont showed their pride in line, carrying purses designed with a collage of magazine covers featuring the Obamas. “She motivates us,” Walker said. Shabazz said that as a working mother, sometimes she looks down on herself about certain things, but when she looks at Obama she sees it is possible to have it all. “You can have a successful working career, a good husband, children and still do it big,” she said.